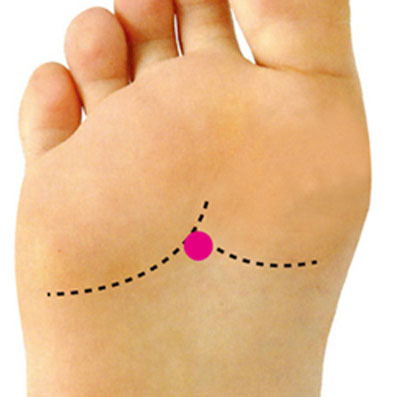 The first point of Kidney Meridian is the only place that offers traditional acupuncture sole. His name is Yong Chuan and is translated as Bubbling Spring. With this name you already can imagine that it is a bubbling fountain of remedies, with many possibilities when disparate treat ailments. Stimulating this point we can try from sunstroke to lack of milk, knee pain, Hypertension, Epilepsy, headaches located at the crown, toothache, vomiting, diarrhea, Constipation, sleep disturbances, pain in the foot and fingers, cramps in calves, nasal bleeding that does not stop, hysteria, fear, dizziness, fever, asthma and coughs. As I have said, this point is located at the foot, and more specifically in the depression between the metatarsal bones of the second and third fingers. If you would like to stimulate this point in a continuously, we can put a grain of rice on it and secure with a little tape. With every step we take we are getting the benefits it provides this source of remedies.